Note the bronze plaque on the sidewalk east of the penitentiary walls. 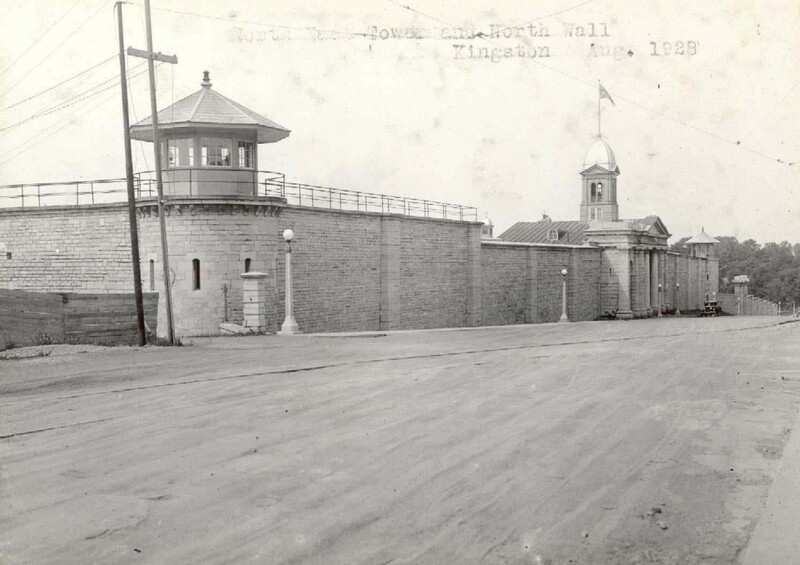 On April 30, 1997 Kingston Penitentiary was designated a National Historic Site of Canada. The gatehouse design by architect William Coverdale appears ominous. The columns evoke the idea of strength and the “pillars of justice”. The gatehouse bears a date of 1845 on its south façade, facing the interior of the compound. The prominent bell tower was not added until 1895. Upon being admitted to Kingston Penitentiary in the 19th century, a prisoner was stripped of his clothing and personal possessions, which were packed and stored until the end of his sentence. After bathing, he had his hair and beard shaved off. His name was entered with a sequential number in the Convict Register. Any special marks such as tattoos, birth marks or scars were recorded, along with his age, height, weight, eye and hair colour and complexion. He was then given a prison uniform consisting (until 1890 when the pattern changed) of a parti-coloured jacket, waistcoat and trousers, one side of which in the summer was black and the other white or brown and yellow in winter. He also received a flannel shirt, leather shoes and a soft cap. The familiar black and white striped uniform that one often sees in cartoons was an American pattern not used in Canada. The individual registration number was stamped on his articles of clothing for identification purposes. Sadly, the gatehouse you are observing was the scene of an escape in 1948 involving the death of penitentiary Guard and Messenger John D. Kennedy. The Kennedy family has been associated with K.P. over a number of generations. Like his father before him, John was the Prison Messenger at the Kingston Penitentiary for many years. His history was uniquely tied to Kingston Penitentiary due to the fact that he was born in an apartment within the old west gatehouse (demolished in 1926) facing the harbour, in the general area of the guard tower near the middle of the wall. Employees of the penitentiary put themselves at great personal risk in the course of their duties and the Messenger was no different. On 26 April 1948, Officer Kennedy was the victim of a violent escape by two prisoners: Austin Craft and Howard Urquhart. On that morning, the officer was driving across the penitentiary compound to the north gatehouse to exit the facility. On the way, he saw inmate Craft, who was also on his way to the gate (because that was where he disposed garbage as part of his assigned work). Knowing Craft, he offered him a ride to the gate. Unknown to the officer, hidden in the trunk of the car, was another prisoner, Howard Urquhart. Once inside the gatehouse, Officer Kennedy stepped out of the car as per procedure in order to show that he was not being held hostage. As the outer gates were being opened, Craft pulled a gun that had been hidden under the rear bumper of the car and let Urquhart out of the trunk. He then began firing as he jumped into the driver’s seat. In the melee, Officer Kennedy was struck by a stray bullet and died. Craft then roared through the open main gate and made his escape. This resulted in a large-scale search of the area, when police across Ontario were notified of the escape. However, the search was quickly over and, later that day, Craft and Urquhart were captured in the village of Sydenham, not far from Kingston. For his role in Kennedy’s death, Craft was sentenced to death. His hanging in 1949 was the last execution to occur in Kingston. Craft was hung in the Frontenac County Jail (demolished 1973-4), located behind the Frontenac County Courthouse. While capital punishment was legal in Canada until 1976, it was only practiced until 1962. Capital executions were never carried out at Kingston Penitentiary itself, as executions were carried out at county or provincial jails.